Once again I have been blown away by two fantastic days of wildfowling, stalking and bird watching in North Norfolk. Standing in the blue dawn on Wednesday morning as the geese began to flight off the freshwater marsh, I was in a quandary as to whether to watch the massed, writhing ranks of pinks ahead, or turn to spy on the engrossing activities of two coveys of grey partridges behind. The little partridges were indistinct in the gloom, but their enthusiastic skreiking allowed me to make them out as they scuttled through the short grass. Two birds chased one another furiously around in a random pattern while the others watched, then they would join the main group and what seemed to be another two would come out and race around through the dead thistles, never more than thirty yards away. Their antics disturbed a couple of hares, which lolloped out through a post-and-rail fence and into a wide plain of winter wheat. As the geese grew restless down against the sea wall, the wild partridge game reached a climax of calling and scuttling, and they finally rose as one in a swirl of dark shapes almost as the first skeins began to rumble up and head towards the hedge where we were standing. 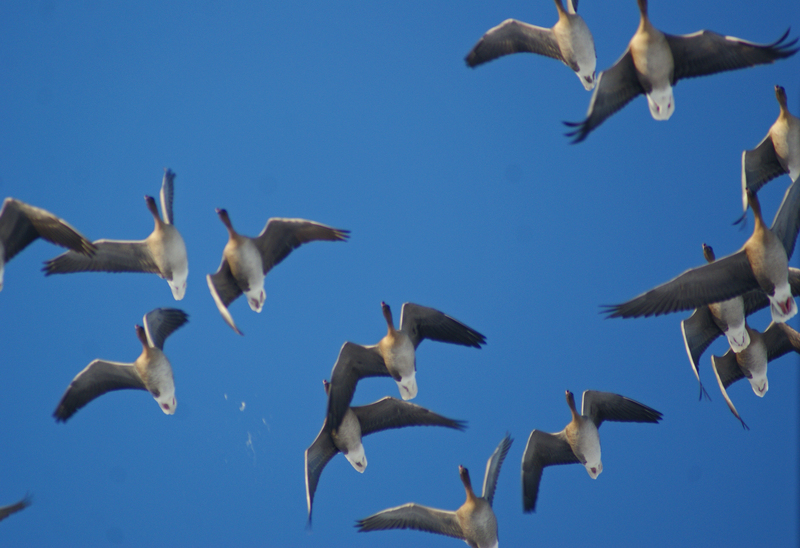 As it happened, a slight breeze allowed the geese to gain some good height by the time they passed overhead, and the thrilling lines of belling birds passed out of range overhead. I had my gun down by my side anyway, standing with my mouth hanging open as the whistling stacks of muscle and song came working by. The great joy of geese is their unassailable timelessness; the very sound of a pink-foot is the distilled essence of some deep, primal element, and when it is massed into a choir of endless scale, it comes within a whisker of bringing a tear to the eye. We stood and watched them pass overhead for five minutes: lines and Vs and ticks; groups of a hundred alternating with tangles of ten and thirty in a continuous, unbroken swathe, the end of which was still rooted on the soggy mud half a mile away. I could feel my heart pounding in my chest and roaring in my ears, feeding on the swelling joy that this sky-filling ensemble seemed to stir above the flat and infinite horizon. During a brief lull in the flight, we worked our way down onto the marsh towards the geese in the hope of finding some birds before they had managed to gain some height, and no sooner had we settled beside a wavy, sloshing ditch of reeds did a skein rise up and pass straight into us. We rose from the water and shots clattered out. With a resounding splash, three birds came down to earth as the remainder silently rose up into the brightening sky. It was only half past eight, and we had a day’s shooting to get to. There are more black grouse in Strath Don than almost anywhere else in Scotland, but what would happen if the big estates were broken up? While Scotland is whisked up into an exaggerated frenzy by the Nationalist harpings of “land reformers” and xenophobic pseudo-socialists, it is worth considering the impact that any move to break up the traditional highland estate would have on Scottish wildlife. As the great belly of Alex Salmond begins to rumble in anticipation of the independence referendum, it is a time of strange curiosity for those of us who support the Union. Amidst limitless promises of public funding for everything that you can ever dream of, elements of the SNP government are finally turning their sights on the country estate as the iconic symbol of Scotland’s colonial subjection beneath a “foreign” yoke. There are so many problems with the proposed “land reform” that I don’t even know where to begin to tackle them. That said, I don’t want this blog to become a political platform (although I will certainly return to the subject in due course), but the idea of deliberately breaking up large estates into a mosaic of small, community owned holdings will have immediate ramifications for the hills and moors and the birds that crouch upon them. You need only return to my homeland of Galloway to see what became of the uplands when the traditional estate system was abandoned after the First World War. The first signs of collapse came when big estates were broken by debt and could no longer afford to maintain themselves, selling off farms to tenants and other landowners. Smaller, independently run upland farms became hard places, because without the financial support and backing from “the laird”, resources were tightly stretched. While the estate was alive, a bad year on the hill could be balanced with a profitable year on the low ground. Hill ground could be run for a poor profit because it was an important asset as part of a larger entity, providing summer grazing for sheep and cows. Try to run hill ground independently and you are forced to stock heavily to make the most of the ground (and today, the headage subsidies), and in no time at all the heather has gone. It is absurd to imagine that you could farm hill country today and make money doing so without subsidised input, and I can’t think of a single hill farm around my ground in Galloway that is not farmed as part of a larger venture which includes low ground. In other words, they form part of an estate. Even my own tenant brings cows and sheep up to the Chayne in the Spring from his own farm down by the Solway, and the idea of using the Chayne as an independent agricultural unit is financially unthinkable. When the Forestry Commission came to Dumfries and Galloway after the Second World War, many of the independent upland landowners breathed a collective sigh of relief. The unprofitable ground couldn’t pay for itself without support from downhill, and they threw their arms around any new way of making money. Within 40 years, hundreds of thousands of acres of marginal land vanished beneath commercial woodland. In the absence of integrated land use as part of a larger estate, landowners had to make the best of each independent parcel of land, and this never happened without exerting a major toll on the wildlife. In fifty years, we have lost the huge majority of our black grouse, mountain hares, golden plover, ring ouzel, lapwing, curlew and wild goats. The few areas of red grouse are now dangerously fragmented, and eagles and hen harriers are few and far between. It is certainly worth noting that the area where wildlife has suffered worst is already owned by the people of Scotland – and lovingly ruined in our name by the Forestry Commission. The collapse of the traditional estates opened the door for habitat degradation, and in South West Scotland, the coup de grace was administered by commercial woodland. 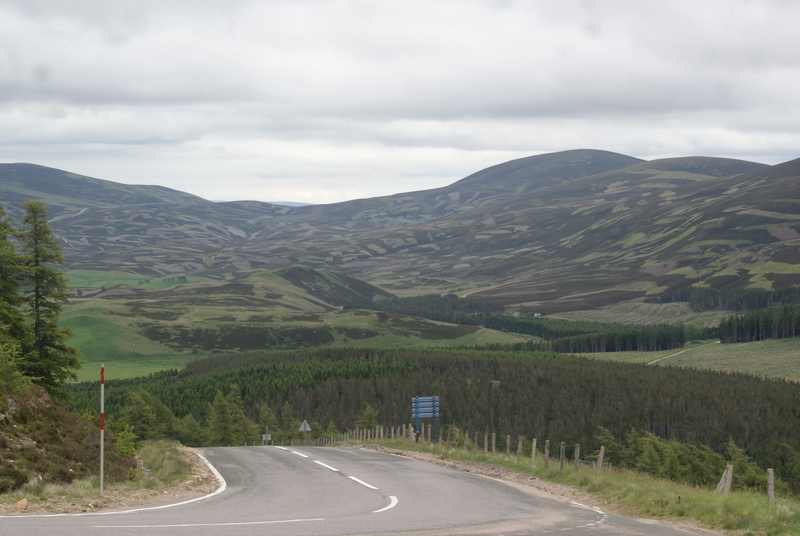 As “land reformers” build up a head of steam about breaking up estates, the Scottish government is talking about further expanding Scotland’s forest coverage, and without cohesive involvement from large landowners who would be able to integrate trees into the landscape, history could well repeat itself with devastating effect North of the Highland Line. The structure of these huge highland estates is not sprawling and haphazard, but actually acts as a cohesive unit made up of several disparate land types. The farming is integrated with the sporting interests, which is linked to the woodland, and all depend upon one another to function. It is easy to imagine that the scale of these huge estates is a result of financial posturing, but their very scale is part of their conservation success. Chippy suburban goatees may not like the idea of the “laird”, but in wildlife conservation terms, it makes total sense to look at management on a landscape scale with a single individual making the key decisions on land use over many thousands of acres. How on earth the Scottish Government plans to build conservation into a Scotland made up of a million tiny, disparate interests all trying to make a viable business by pulling in different directions, I don’t know. The best places I know for black grouse are where the moor is run to complement the adjacent woodland and farmland. What would happen to these delicate balancing acts if their various fragile components were pulled apart and given to different parties? Simply, it would spell disaster for black grouse in particular and upland wildlife in general. Once the squeeze is felt, the Scottish Government will be obliged to fund extensive conservation measures, which for any other government would be a major demand, but which would present no problem for Alex Salmond and his legendary bottomless sporran. I am quite confident that there are some careless lairds who could do more for their tenants. I think I know some of them. But the stupidity of a few individuals is a poor reason to re-invent the entire system, and risks throwing an extremely complex infrastucture into turmoil. Many of the most ardent reformers present their arguments with such an unsavory “Violet-Elizabeth Bott”-style that it is difficult to imagine that they would be any more popular as land managers than even the most despised laird. Scottish wildlife hangs in the balance in many places, and it surely makes sense to improve on what we have, rather than embark on some politically motivated journey into the unknown. A fine young blackcock on a frosty March morning. Is there any better sight in the world? Today is the fourth birthday of this Working for Grouse blog, so that is worth commemorating in some way. As far as the statistics go, I am fast approaching 100,000 unique visitors, with many of them in past eighteen months. This is without much in the way of advertising or promotion beyond the occasional “tweet”, and it’s very flattering to see that such a huge amount of people have bumped into this blog. Over the past few years I have made a number of really good friends from people who have contacted me after encountering Working for Grouse, and that is not to mention a good number of mortal enemies, which can only be a good thing. Thanks in part to this blog and the people who read it, I have been able to convert my passion into my living, and I am extremely grateful for the pleasure it gives me. The struggle to conserve and promote black grouse as a gamebird continues with the same enthusiasm as all those many months ago, and I am still as wholly devoted to those fine, heart-swelling birds as I was on the first morning I ever clapped eyes on one. 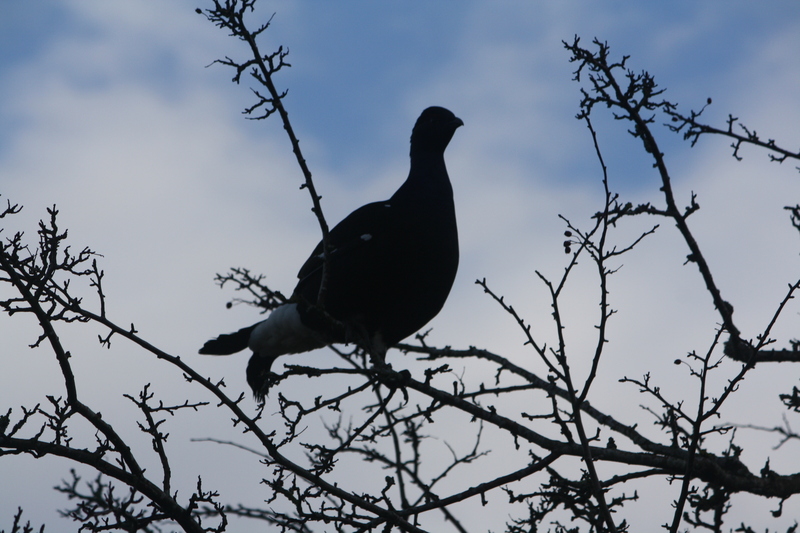 Over the last year, several people have been in touch with me for advice and consultancy on black grouse conservation, both of which I am thrilled to offer, either in person or via the telephone or email. You can contact me by leaving a comment on any of my blog articles and I will aim to get back to you whenever I can. There is a great deal more to cover, so roll on another year! The steep gully earmarked for planting. Amidst the ongoing misery and upset of continuous sleet, snow and rain, I found a moment yesterday to pace out and plan my “big” woodland project for 2014. Having finally wrested control of 3Ha of the hill back from my farming tenant, I am keen to see that it is put to good conservation use. Approximately one Hectare of the chosen area is made up of a steep-sided gully which I hope to plant up with willows and alders in due course. This gully runs perpendicular to the woodcock strip, which I am currently in the process of felling and replanting, and it runs about two hundred yards off the point of the strip at its highest point. These new trees will be of some use to the black grouse, and although I spend much of my time on this blog raving about the ridiculousness of basing a conservation policy on planting trees for a bird that won’t use them, I have put considerable thought into this idea. Not only is the location of the wood suitable for snaring and lamping, but it is also small enough to be driven to waiting guns on a wet day. There is no point whatsoever in planting trees unless you are prepared to keep the foxes out of them, and so much quality black grouse habitat has been lost to trees which were dropped on the landscape as if their very woodiness would somehow fix every problem for the birds. By planning how I will keep the wood clear of foxes before it has even been planted, I feel like I will save myself some serious time and effort further down the line. I have also made sure that, as the trees grow, they will not provide habitat suitable for winged predators, and the height of the trees will diminish as the wood ascends the hill. The last thing I need is for tall trees to be overhanging the moor, and the plan is that as the wood runs up onto the hill, it will fizzle out into a scattering of hawthorns and willows which can be coppiced and kept short to stop predators and scavengers from getting a look in. A good Hectare of the designated area has a very strong heather and cranberry mix, so I will let this do as it pleases, and the third Hectare is whiter and wetter. I have a plan to plough some of this to see if it invigorates the seed below, then plant the odd hardwood and scots pine to create a very loose scattering of stunted trees at extremely low density. This should not only create habitat for black grouse which will run out onto an extensive area of open ground available in all directions, but it would gradually come to be the kind of rough, quiet spot used by roe deer, woodcock and hares. I have particular interest in incorporating the kind of cover that cuckoos like, and from what I know of cuckoo habitats in the uplands, I think that this ties in very nicely with the overall concept. Aside from anything, this project aims to demonstrate that a small area of properly managed “rough, thorny scrub” where vermin control is built-in from the beginning is a very different style of “woodland” than that espoused by the perpetual drone of conservation bodies who have a vested interest in generating timber. It is only on a very small scale, but woodland plantings on behalf of black grouse should never be extensive plantations if they hope to be sustainable, and rather than make problems for the overall management of the moor, it should add considerable conservation value. The key will be to manage the trees when they come through and snip off the inevitable sitka, but all that lies ahead of me. First, I have to build 500m of fence. While walking the dog and checking some traps on the Chayne in the rain this afternoon, I wandered past some of the cuts I put into the rushes in September with the tractor. So much of the cutting theory designed to be used on heather for grouse also works for waders in wet pasture, and I have high hopes for this enormous snail’s shell which I cut into a very thick sea of rushes and tussock grass in the last days of the summer. Unlike heather, these cuts need to be renewed almost every year, and some areas will have to be cut again before the curlews and snipe start to breed. It has been so mild this winter that the rushes have grown more than eight inches up from their stumps since they were cut, despite the fact that they are supposed to be lying dormant during the short days. If it’s dry enough in March then I’ll take a day or two with the tractor and break up some of the denser stands of tall grass and rush, reinforcing the cuts with fresh areas of very short vegetation. An advantage of doing this kind of work in the autumn is that the sheep use the tracks to make inroads into the denser vegetation over the winter, keeping the cuts short and trampling them so that they are sloshy and broken when the waders appear. It also allows me to set up tracks and paths which are easy to snare in the lead up to April when the sheep are down on the inbye prior to lambing and catching foxes on this kind of ground becomes the priority. In previous years, this kind of deliberately designed “edge” habitat allowed snipe to settle in almost double the density of unmanaged years, and I’m already looking forward to hearing the sky come back to life with whizzing drummers in just a few weeks time. The Forestry Commission is ironically proud of its goats today. Dealing with wild (or properly “feral”) goats over the past couple of weeks, I managed to pick up a great book on the subject by G. Kenneth Whitehead. Goats have been in the news recently after the RSPB decided to cull some on the banks of Loch Lomond and over to Loch Katrine where I spent a great deal of time walking and exploring while a student in Glasgow. Partly to get an idea of the roots of this controversy (which in reality is no controversy at all) and partly to better understand the well-known and high-profile herds of goats in Galloway, I bought the book online and have been raking through it with great delight. 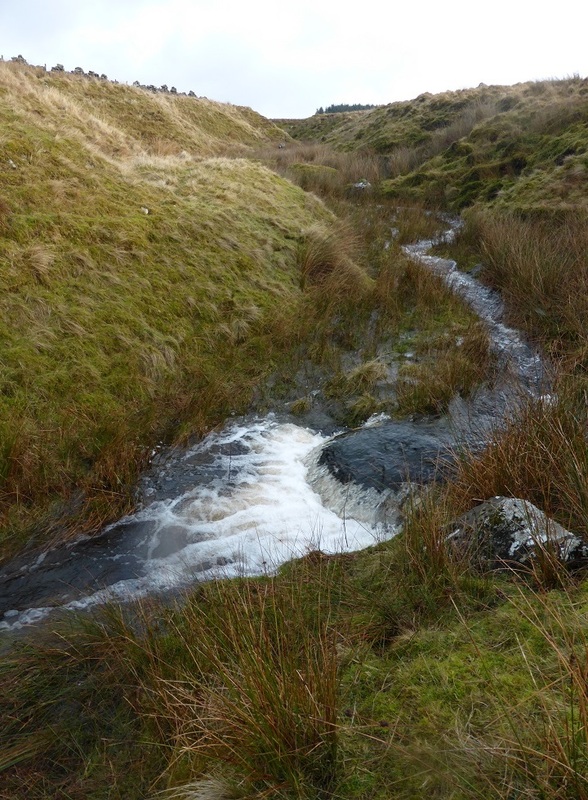 I would be lying if I said that goats really “floated my boat”, but they have undeniable value and deserve consideration when looking at the management of moorland. What struck me most dramatically was the history of goats in Galloway, which, since the Second World War has been a story of loss and collapse. The goats which are now found near Clatteringshaws are wheeled out as a spectacle for visitors by the Forestry Commission, and several of them depend on a supply of feed set out by rangers, who conveniently place their hecks next to the road. It seems, however, that the goats have not always enjoyed such lauded celebrity status in the eyes of the foresters. An appendix in the book details every known herd of wild goats in Britain, including notes on the current status of each. In Galloway, the list is a long one, but all too often the comments include the simple sentence: “Exterminated by the Forestry Commission”. Herds of goats at Dalbeattie, Screel and Bengairn, Kirroughtree, Craignelder, Cairn Edward and across huge swathes of what is now the “Galloway Forest” were wiped out when the foresters arrived to plant the hills. Some of these herds had been on site for centuries, and it puts the current RSPB position at Inversnaid into context. The Forestry Commission was not out to “cull” or “control” these goats, but deliberately annihilated them, root and branch. 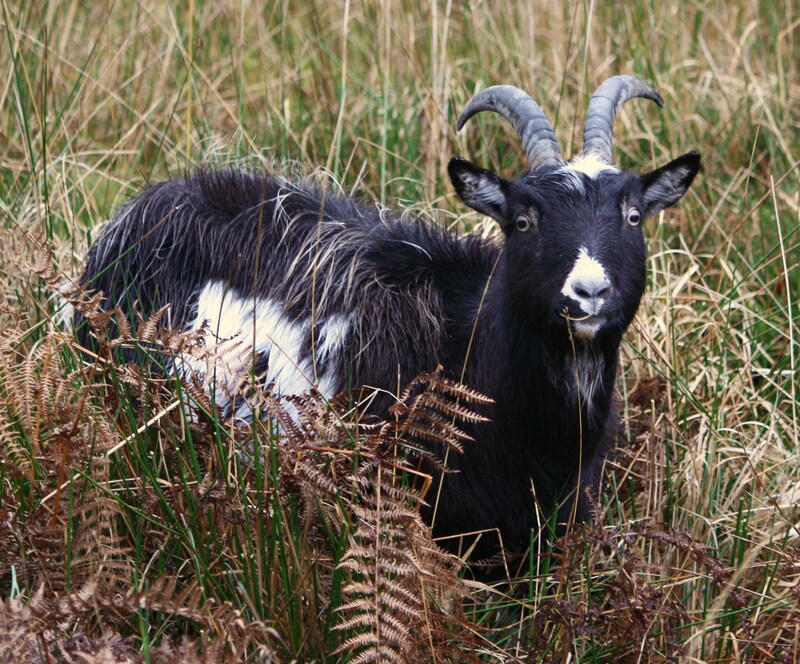 We will probably never really come to terms with the staggering damage caused to our uplands since the Second World War, but the loss of these irreplaceable goats, many of which had local characteristics now permanently consigned to history, is just another symptom of what happened when the foresters came to town. Only now are we beginning to come to terms with the gravity of peat loss and ruined upland Carbon storage, and the crowning failure of the Commercial sitka plantation will be the moment when, having spent thousands of pounds of tax payers’ money in subsidy to plant the trees, the general public will be asked to subsidise the restoration of the damage caused. Perhaps this was excusable when we “didn’t know any better”, but nobody is in any doubt as to the harm caused by ploughing and planting in the uplands today, and yet still the foresters rip up the peat and bury the heather beneath a serrated mesh-work of foreign spruces. It is why I look at wind turbines as something of a benign curiosity. Before a wind developer is able to even stick a bamboo marker in the ground, extensive bird surveys and ecological tooth-sucking have to take place. Huge sums of money are set aside to mitigate the damage caused by the temporary appearance of heavy machinery. Imagine the uproar if a windfarm was shown to have displaced a single hen harrier, let alone annihilate a population of wild goats or cause the county-scale destruction of the moorland environment. As an industry, wind development is ineffably more conservation minded, and yet turbines attract all the criticism while the Forestry Commission continues to destroy the uplands with the smiling support of government and society. I’d love to say that ranting and raving has made me feel better, but it hasn’t. Having spent the past few days trudging through some pretty dry scientific material about grouse nutrition and territory size for an ongoing Heather Trust project, I bumped into an unassuming paper last night called “phylogeography and subspecies status of black grouse”. The way science is currently being thrown around as a weapon of combat in modern conservation makes me take much of it with a pinch of salt. Scientists squabble about how their science is “better” than their opponents, and anything which has not been empirically proven one way or another is treated as little more than anecdotal dirt. Even when facts and figures are forthcoming, their interpretation is one of the great “grey” art forms. Just look at the Joint Raptor Study at Langholm in the 1990s. Thousands of pounds of taxpayer’s money went into funding that piece of research, and yet even fifteen years later there is no consensus as to what it actually taught us. The figures generated by the current Langholm Moor project (where and if they are available at all) are held to mean all kinds of different things by the various interested parties. Nobody would deny that science is the vital framework for conservation, but a report with a title which includes the word “phylogeography” probably does not have much to communicate to the man on the ground. Aside from anything, so much of the science around moorland gamebirds appears to have been written by people who have forgotten why they were ever interested in the subject in the first place, and so much of it is woefully hard going. Half way through the abstract, I encountered expressions like “bell-shaped mismatch distribution” and “star-shaped phylogeny”, both of which represented an apparently conscious attempt to repel even the most determined layman reader. But I persevered. I’m not going to say that I enjoyed reading the report, and I would not suggest that any of my readers should even try (although it is HERE for a very, very rainy day). 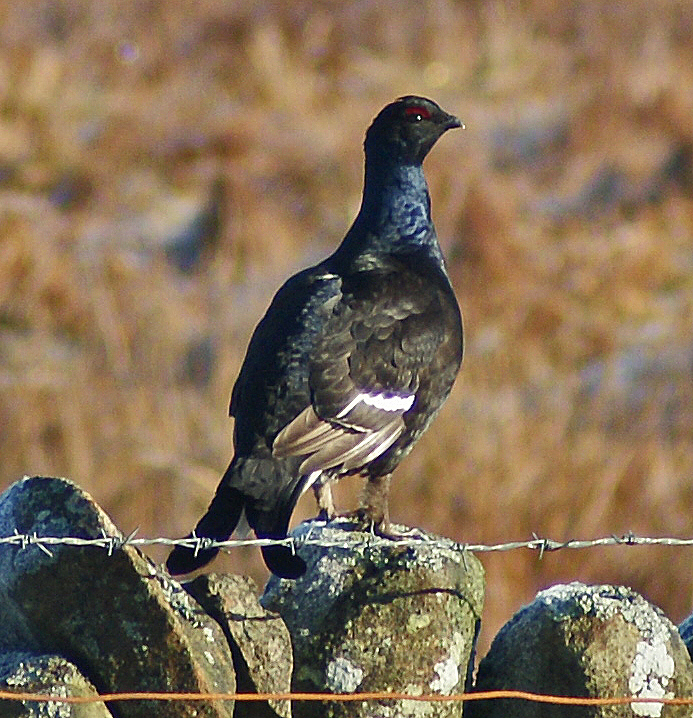 In essence, the thrust of phylogeography is “talking about where the different kinds of things are”, and the report discusses the fact that black grouse have a number of subspecies (the precise number is up for discussion), and tries to work out where the different subspecies are and how they have ended up there. We have our own subspecies of black grouse in Britain (tetrao tetrix britannicus), and several other blends and mixtures of genetics and bloodlines cover the birds which run in a relatively unbroken spread from the Alps to North Korea. I didn’t know that there were black grouse in North Korea, but given that they are doing well in China, it makes sense. If nothing else, it demonstrates the flexibility of the species to think that it can live over such a huge area. We now feel very precious about our black grouse in this country, making them out to be inherently weak and unable to look after themselves. When you look at the birds in an international context, you see that it is only because we have systematically beaten black grouse out of every habitat requirement they depended upon in this country. So targeted and wholesale has our destruction of their habitat been that an intergalactic observer could easily be fooled into believing that we have made these changes specifically to destroy this species. Given half a chance and with a fair wind, black grouse numbers boom, as is the case from Kyrgyzstan to Mongolia. I must look into the kind of habitat that black grouse occupy in the Far East, because if nothing else, I feel sure that it does not look like the Chayne.